A Financial Management Analyst assists the organization, firms, and businesses with its long-term financial goals and planning, they help the management when it comes to making investments or funding, they also create and implement investment plans and aid in the organizational long-term goals. A professional financial management analyst studies the investment options and evaluates the strength, security, and stability of the same. Normally financial management analysts are hired to coordinate financial operations, financial research and management. Additionally, the Financial management analyst shoulders other responsibilities like creating policies, organizational structure, work assignments, information handouts, and work procedures. 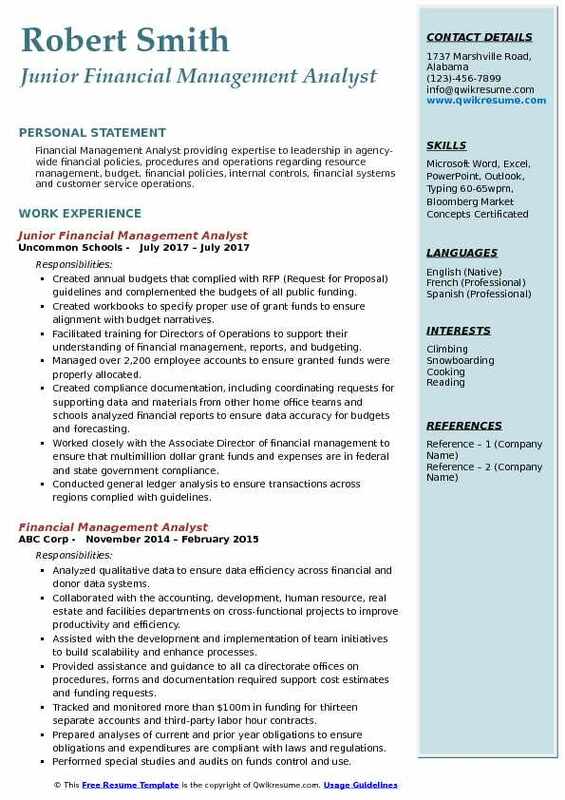 The minimum educational qualification that is required to be mentioned in the Financial Management Analyst resume sample for making a career in this line is a Bachelors Degree in Economics or Finance or Accounting, however many of the company’s emphasis on specialized segments like risk management or statistics as a major subject. 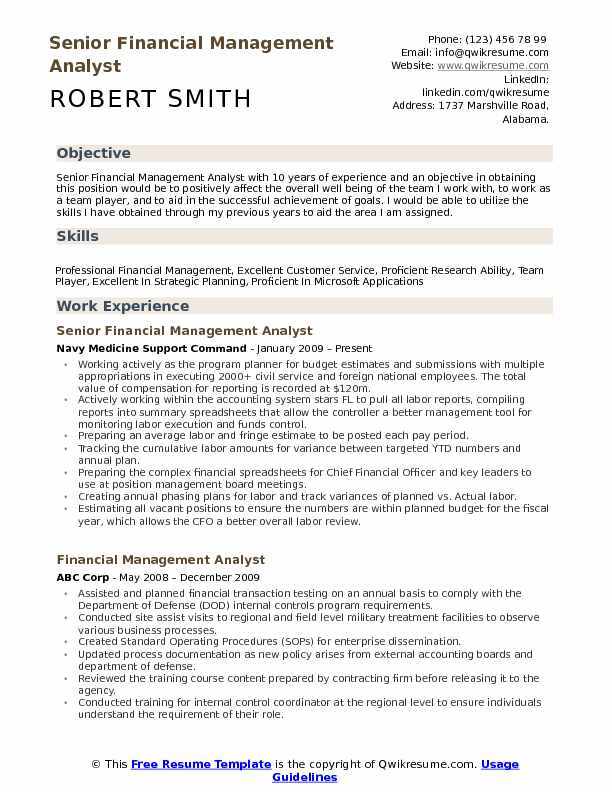 Summary : Senior Financial Management Analyst with 10 years of experience and an objective in obtaining this position would be to positively affect the overall well being of the team I work with, to work as a team player, and to aid in the successful achievement of goals. I would be able to utilize the skills I have obtained through my previous years to aid the area I am assigned. Working actively as the program planner for budget estimates and submissions with multiple appropriations in executing 2000+ civil service and foreign national employees. The total value of compensation for reporting is recorded at $120m. Actively working within the accounting system stars FL to pull all labor reports, compiling reports into summary spreadsheets that allow the controller a better management tool for monitoring labor execution and funds control. Preparing an average labor and fringe estimate to be posted each pay period. Tracking the cumulative labor amounts for variance between targeted YTD numbers and annual plan. Preparing the complex financial spreadsheets for Chief Financial Officer and key leaders to use at position management board meetings. Creating annual phasing plans for labor and track variances of planned vs. Actual labor. Estimating all vacant positions to ensure the numbers are within planned budget for the fiscal year, which allows the CFO a better overall labor review. Formulating FTE reports for corporate data calls. Calculating the adjustments to estimates by applying standard formulas and percentages rates. 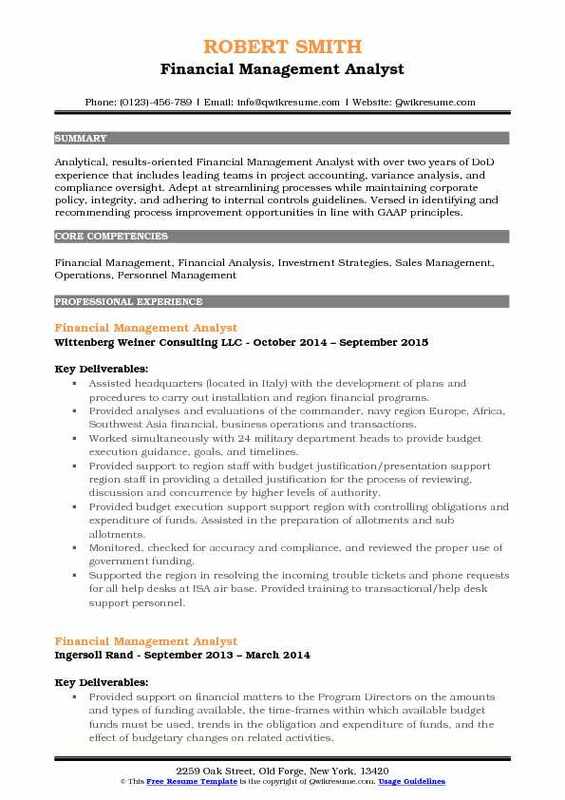 Summary : Financial Management Analyst I with 12 years of experience wants to obtain a challenging financial, brokerage or sales position within a reputable company that will enable me to utilize my tactical skills for mutual growth and success on a long-term basis. Served as the fixed assets subject matter expert for non-appropriated fund (NAF) construction. Reviewed installations capital budget submissions for accuracy and consistency and assist with questions. Analyzed and reported on financial operations, business performance and functional projects of NAF construction projects. Prepared post-occupancy analysis on completed construction projects to evaluate post-construction performance to present to the construction committee. Consolidated and prepared capital investment summary report for submission to the Office of the Secretary of Defense (OSD). Prepared project reports for submission to the Director, Chief of Staff and Chief Financial Officer and recommended the management actions when financial data shows unfavorable trends or deviations from plans. Prepared construction renovation escrow to distribute to installations for all central construction fund NAF projects. Prepared financial viability model for all installations to be used to determine installation affordability. Reviewed Project Validation Assessments (PVAs) compiled by contractors for financial accuracy. 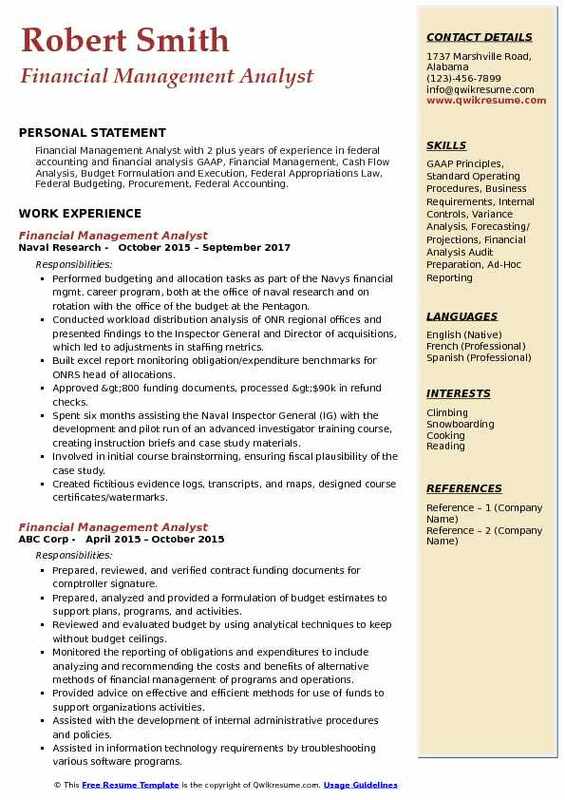 Summary : Financial Management Analyst with over eleven years experience delivering detailed program budget analysis and financial management within the Department of Defense. Adept at providing superior service to the client with utilization of multiple financial tools and strategies. Demonstrates an ability to work congruently with other team members and independently in diverse, time-sensitive and high-intensity environments. Performing financial and program analysis onsite support for the headquarters department of the army, deputy chief of staff G-8 as Executive Agent Secretariat (EAS) for the Chemical Biological Defense Program (CDBP). Creating and articulating briefings, providing assessments, and recommendations to inform army senior leaders of status and impacts of resourcing decisions, whether financial or programmatic, within the CDBP. Providing technical expertise to inform actions and decisions related to the joint capabilities integration development system and other requirements generation methods and procedures. Demonstrating the ability to interpret, provide knowledge and analysis of all phases of the planning, programming, budgeting, and execution process. Facilitating and reviewing the army data inputs within the joint service chemical biological information system, which is the CDBPs financial system of record, for financial and programmatic analysis. Utilizing pivot tables and charts to manipulate data in preparation to depict visual aids and interpret trends for presentation to senior leaders and decision-makers. Performing data mining techniques using advanced Microsoft Excel formulas and techniques, such as Vlookup, sum, and Sumif, to swiftly capture needed data for presentation. Summary : Financial Management Analyst III experienced in federal contracting with a diverse background that includes data collection, customer service, and technical writing. Currently responsible for a wide array of daily tasks and impromptu requests from users of the Federal Procurement Data System (FPDS) and the FPDS Project Management Office. Quick to understand complex problems, determine potential obstacles, and provide solutions. Formulating the cash flow statements and financial reports of financial performance on profit loss data, business volume expense highlights, acquisition business line schedules and contract workloads for both national and regional directors. Reviewing and evaluating the financial operations and methods for GSS supply business line. Developing and presenting the monthly Powerpoint presentations of acquisition operations business line performance measures and financial data for GSS commissioner and acquisition operation director and regional director to help make decisions to manage the acquisition operation business processes. Summarizing the financial data taken from the organizations accounting records and publishing in the form of monthly, annual (or more frequent as requested) reports for the benefit of GSS/Acquisition Operation Directors. Performing, presenting and advising the senior officials of budget administration including formulation of budgets and estimates to support plans, programs and activities. Reviewing and evaluating the budget requests, controlling and reporting of obligations and expenditures within GSS and in coordination with other agencies. Performing budget execution and administration work involving the monitoring of obligations incurred and the actual expenditures of a budget with different sources and types of funding, such as direct annual, reimbursement funds, stimulus, transfer of funds from other agencies and refunds. 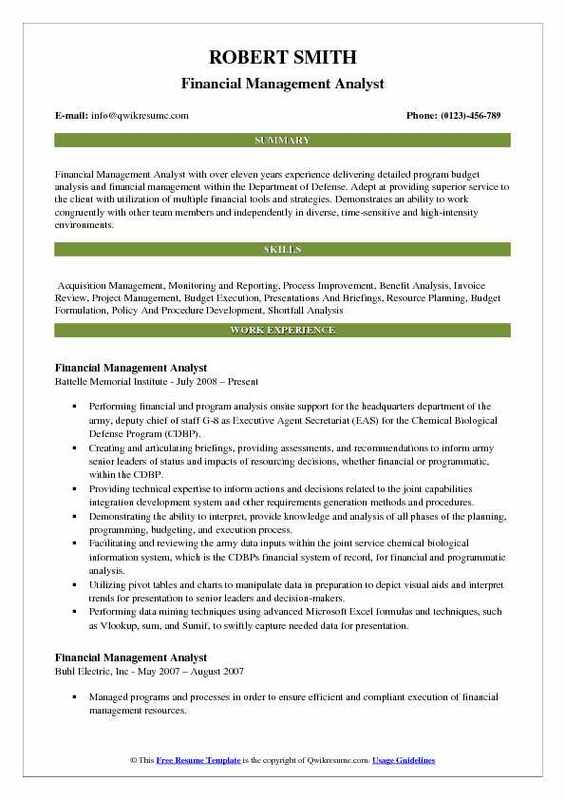 Objective : Financial Management Analyst providing expertise to leadership in agency-wide financial policies, procedures and operations regarding resource management, budget, financial policies, internal controls, financial systems and customer service operations. Created annual budgets that complied with RFP (Request for Proposal) guidelines and complemented the budgets of all public funding. Created workbooks to specify proper use of grant funds to ensure alignment with budget narratives. Facilitated training for Directors of Operations to support their understanding of financial management, reports, and budgeting. Managed over 2,200 employee accounts to ensure granted funds were properly allocated. Created compliance documentation, including coordinating requests for supporting data and materials from other home office teams and schools analyzed financial reports to ensure data accuracy for budgets and forecasting. Worked closely with the Associate Director of financial management to ensure that multimillion dollar grant funds and expenses are in federal and state government compliance. Conducted general ledger analysis to ensure transactions across regions complied with guidelines. 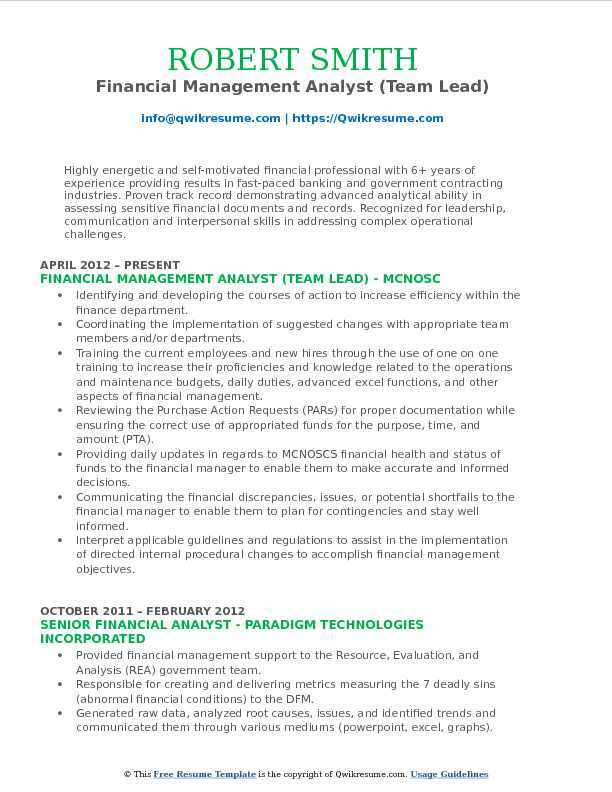 Managed the government, charter authorizer, and donor financial reporting requirements to ensure revenue compliance. Partnered with Massachusetts, New Jersey, and New York state department of education leaders to verify that financials were reported accurately. 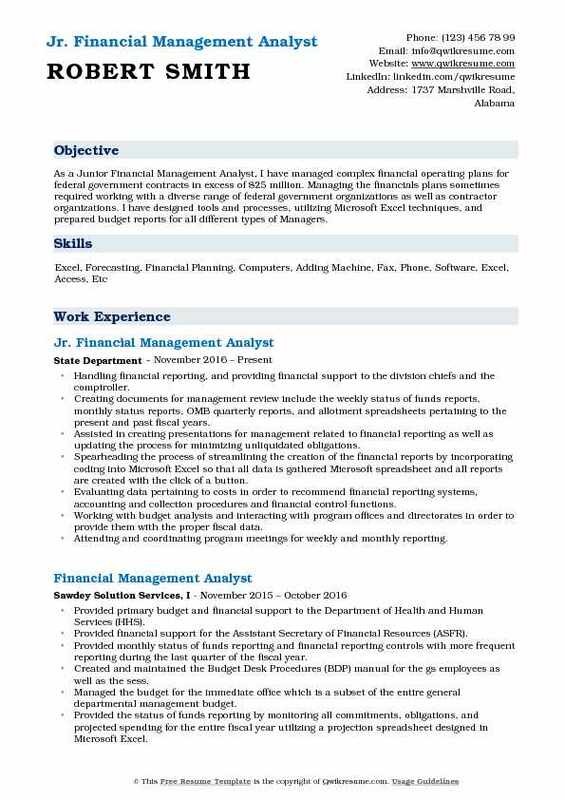 Objective : As a Junior Financial Management Analyst, I have managed complex financial operating plans for federal government contracts in excess of $25 million. Managing the financials plans sometimes required working with a diverse range of federal government organizations as well as contractor organizations. 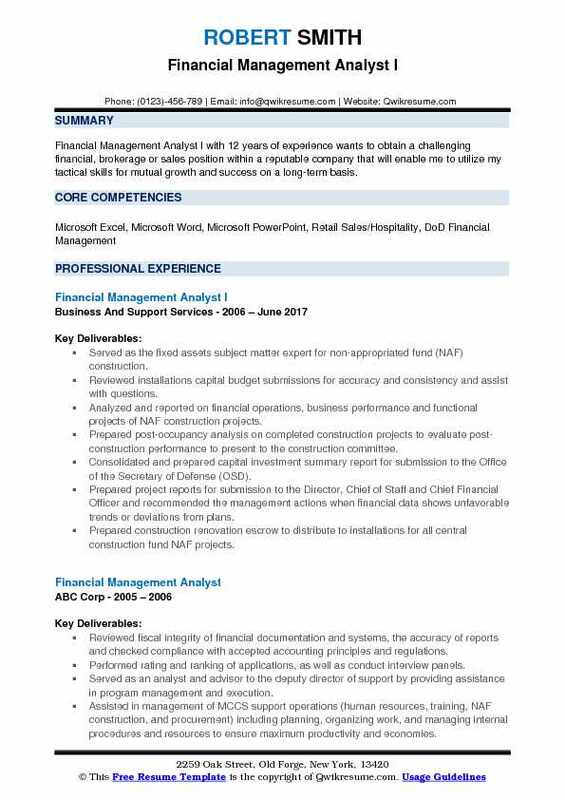 I have designed tools and processes, utilizing Microsoft Excel techniques, and prepared budget reports for all different types of Managers. Handling financial reporting, and providing financial support to the division chiefs' and the comptroller. Creating documents for management review include the weekly status of funds reports, monthly status reports, OMB quarterly reports, and allotment spreadsheets pertaining to the present and past fiscal years. Assisted in creating presentations for management related to financial reporting as well as updating the process for minimizing unliquidated obligations. Spearheading the process of streamlining the creation of the financial reports by incorporating coding into Microsoft Excel so that all data is gathered Microsoft spreadsheet and all reports are created with the click of a button. Evaluating data pertaining to costs in order to recommend financial reporting systems, accounting and collection procedures and financial control functions. Working with budget analysts and interacting with program offices and directorates in order to provide them with the proper fiscal data. Attending and coordinating program meetings for weekly and monthly reporting. Summary : Highly energetic and self-motivated financial professional with 6+ years of experience providing results in fast-paced banking and government contracting industries. Proven track record demonstrating advanced analytical ability in assessing sensitive financial documents and records. Recognized for leadership, communication and interpersonal skills in addressing complex operational challenges. Identifying and developing the courses of action to increase efficiency within the finance department. Coordinating the implementation of suggested changes with appropriate team members and/or departments. Training the current employees and new hires through the use of one on one training to increase their proficiencies and knowledge related to the operations and maintenance budgets, daily duties, advanced excel functions, and other aspects of financial management. Reviewing the Purchase Action Requests (PARs) for proper documentation while ensuring the correct use of appropriated funds for the purpose, time, and amount (PTA). Providing daily updates in regards to MCNOSCS financial health and status of funds to the financial manager to enable them to make accurate and informed decisions. Communicating the financial discrepancies, issues, or potential shortfalls to the financial manager to enable them to plan for contingencies and stay well informed. Interpret applicable guidelines and regulations to assist in the implementation of directed internal procedural changes to accomplish financial management objectives. Objective : Analytical, results-oriented Financial Management Analyst with over two years of DoD experience that includes leading teams in project accounting, variance analysis, and compliance oversight. Adept at streamlining processes while maintaining corporate policy, integrity, and adhering to internal controls guidelines. Versed in identifying and recommending process improvement opportunities in line with GAAP principles. Assisted headquarters (located in Italy) with the development of plans and procedures to carry out installation and region financial programs. Provided analyses and evaluations of the commander, navy region Europe, Africa, Southwest Asia financial, business operations and transactions. Worked simultaneously with 24 military department heads to provide budget execution guidance, goals, and timelines. Provided support to region staff with budget justification/presentation: support region staff in providing a detailed justification for the process of reviewing, discussion and concurrence by higher levels of authority. Provided budget execution support: support region with controlling obligations and expenditure of funds. Assisted in the preparation of allotments and sub allotments. Monitored, checked for accuracy and compliance, and reviewed the proper use of government funding. Supported the region in resolving the incoming trouble tickets and phone requests for all help desks at ISA air base. Provided training to transactional/help desk support personnel. Provided budget support to installation and Region Program Directors. 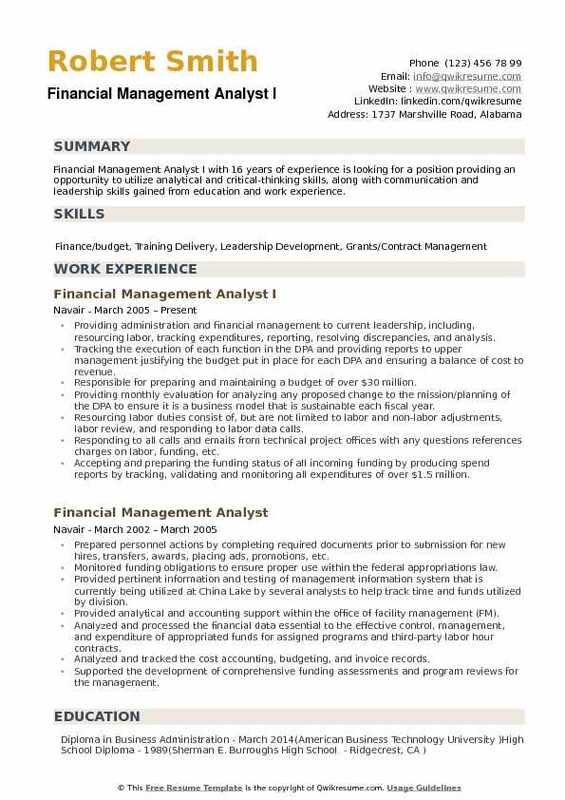 Objective : Financial Management Analyst with 2 plus years of experience in federal accounting and financial analysis GAAP, Financial Management, Cash Flow Analysis, Budget Formulation and Execution, Federal Appropriations Law, Federal Budgeting, Procurement, Federal Accounting. Performed budgeting and allocation tasks as part of the Navy's financial mgmt. career program, both at the office of naval research and on rotation with the office of the budget at the Pentagon. Conducted workload distribution analysis of ONR regional offices and presented findings to the Inspector General and Director of acquisitions, which led to adjustments in staffing metrics. Built excel report monitoring obligation/expenditure benchmarks for ONRS head of allocations. Approved >800 funding documents, processed >$90k in refund checks. Spent six months assisting the Naval Inspector General (IG) with the development and pilot run of an advanced investigator training course, creating instruction briefs and case study materials. Involved in initial course brainstorming, ensuring fiscal plausibility of the case study. Created fictitious evidence logs, transcripts, and maps, designed course certificates/watermarks. Designed/presented a brief to the Navy investigators on tactics for organizing quantitative evidence. 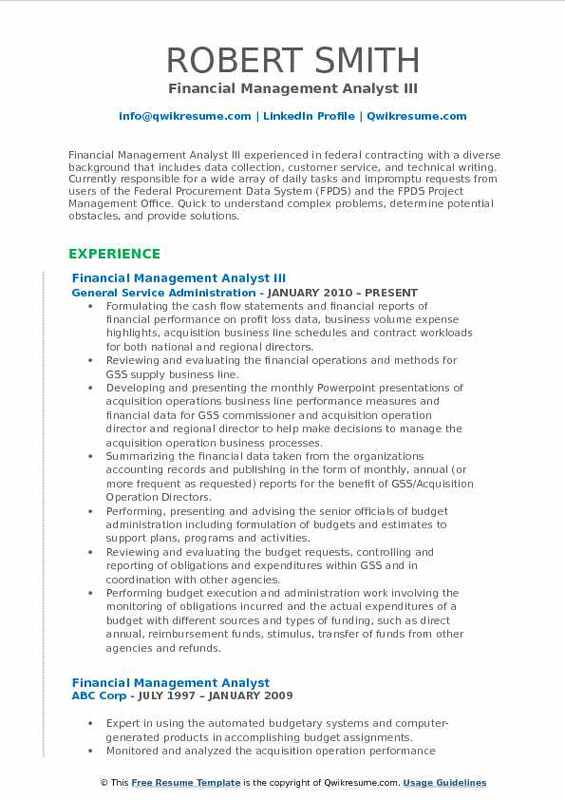 Summary : Financial Management Analyst I with 16 years of experience is looking for a position providing an opportunity to utilize analytical and critical-thinking skills, along with communication and leadership skills gained from education and work experience. Providing administration and financial management to current leadership, including, resourcing labor, tracking expenditures, reporting, resolving discrepancies, and analysis. Tracking the execution of each function in the DPA and providing reports to upper management justifying the budget put in place for each DPA and ensuring a balance of cost to revenue. Responsible for preparing and maintaining a budget of over $30 million. Providing monthly evaluation for analyzing any proposed change to the mission/planning of the DPA to ensure it is a business model that is sustainable each fiscal year. Resourcing labor duties consist of, but are not limited to labor and non-labor adjustments, labor review, and responding to labor data calls. Responding to all calls and emails from technical project offices with any questions references charges on labor, funding, etc. Accepting and preparing the funding status of all incoming funding by producing spend reports by tracking, validating and monitoring all expenditures of over $1.5 million. Tasked with sending funding to other facilities, track spending on these documents to ensure there are no overruns, pull back any unused funding at end of fiscal year.